Although the Christmas Season crowd was smaller than his usual crowd, IKF Promoter Abe Belardo is very happy with a GREAT EVENT last Saturday night at the famous STRONGBOW Stadium in Bakersfield, CA, USA. The night featured 11 bouts with 3 of them being in the IKF Junior Amateur division in which 2 of them were the first IKF Junior Amateur titles ever awarded. Junior Amateur Bout 1: Antwon Washington (50 lbs, 7 years old) of Bakersfield, CA, USA defeated Gurgen Saakyan (50 lbs, 7 years old) of Glendale CA, USA by unanimous decision, 29-28 on all 3 judges cards. Junior Amateur Bout 2: This was the "FIRST EVER", IKF Junior Amateur title. It was for the Boys International Rules California Light Atomweight title. In the bout, Carlos Robo (103 lbs, 13) of Bakersfield, CA, USA defeated Roque Quezada (104, 13) of Wasco, CA, USA by majority decision, 40-36, 37-37 and 39-37. Junior Amateur Bout 3: This bout featured the SECOND, IKF Junior Amateur title but the "FIRST EVER GIRLS" Junior Amateur title Bout . It was for the Girls International Rules California Light Atomweight title. In this bout, Aylin Davtyan (100 lbs, 12) of Glendale, CA, USA defeated Kandra Washington (100, 12) of Bakersfield, CA, USA by split decision, 36-39, 37-39 and 39-37. Mr. Belardo has scheduled his next event in Bakersfield, CA in February, 2000. For more info, contact Mr. Abe Belardo at (661) 834-5871. IKF Florida, USA Promoter Caroline Mixon of The Mac Group in Orlando Florida Promoted a Great event on Saturday night October 3rd that featured 5 Junior Amateur Division Bouts along with Adult Kickboxing and Boxing. Her event marked the first time ever an IKF event featured a full half card line-up of Junior Amateur Fighters. Mixon proved something the IKF has been trying to tell promoters for some time now. That the IKF Junior Amateur program will offer some exciting competition among the younger athletes and bring in a great crowd of supporters for the fighters as well! Sure enough, the house was full mainly because of all the supporters for the Junior Amateur fighters and the bouts? They were some of the most exciting on the night. The IKF plans to feature the Junior Amateurs in a National Tournament in the year 2000 either with the adults National Amateur Tournament schedule or as a completely separate tournament with it's own regional events and championship. Mixon's event proved that not only are there a lot of Junior Amateur fighters out there but there are a lot that can fight GREAT! Here's a rundown of Saturday nights bouts and all the fighters who "Walked the Walk in Orlando USA!" Cory Fox (Orlando, FL, USA, 1-0/1, 54 lbs., 8) defeated Joel Eccles (Orlando, FL, USA, 0-1/0, 62 lbs., 10) by TKO at :59 seconds of round 3. Blake Chambers (Orlando, FL, USA, 1-0/0, 79 lbs., 9) defeated David Hamby (Orlando, FL, USA, 0-1-1/0, 66 lbs.) by unanimous decision, 29-28, 30-27, 29-28. Hamby had agreed the week of the fight to accept the bout even though there was a big difference in the weight (13 lbs.) Despite the weight difference, Hamby fought hard and strong and went the distance. Hamby proved he will be a strong competitor against opponents his own weight in future bouts. History was made in Orlando on this night as well and in the world of kickboxing when the first ever Male vs Female Bout took place. Ten year old up and coming Female junior star Amber Francis (Orlando, FL, USA, 1-0/1, 84 lbs.) stepped into the ring to face a male opponent and Francis didn't let the crowd down. Fighting with true determination and passion, Francis edged out a split decision win over a tough fighting Richard Allen, (Orlando, FL, USA, 0-1/0, 80 lbs., 10) 29-28, 28-29 and 29-28. This was a great fight that could have seen either fighter get the win and if anyone wants to give Allen a bad time for losing a great bout to a female, we suggest before you spout off any comments, maybe you should step into the ring against Francis. For these two, as we said, both fought a GREAT FIGHT! Heck, maybe we should say, before you give Allen a bad time, "Step into the ring with HIM as well!" Great fight you two and did you ever "Walk the Walk!" Lena Taylor (Orlando, FL, USA, 1-0/0, 113, 12) followed up the "Girls Night Out" in Orlando with another split decision win over her male opponent, Chris Kahn. (Orlando FL, USA, 0-1/0, 101, 12) Taylor added to the crowd excitement for the girls this night in a great fight that again, could have went either way, and again in support of Kahn, before any of you people give these boys a hard time,,,,, Step in the ring and "Walk the Walk" with him! Kahn gave up "12" lbs. to accept this fight and against boy or girl, that's a big difference in weight. Again, GREAT FIGHT you two! Daniel Wallace (Orlando, FL, USA, 1-0/0, 116lbs, 12) defeated Robert Tims (Orlando, FL, USA, 0-1/0, 108 lbs, 12) by unanimous decision, 30-27, 30-27 & 29-28). Tim's and his trainer choose to give up the difference of the weight (8 lbs.) which proved to be the difference as Wallace was simply too strong for Tims. Tims will prove to be a strong competitor though against fighters in his weight class in future bouts. Mixon's next event probably won't be until this coming spring but this event marked the end of a great year for IKF Kickboxing and The Mac Group in Florida, USA. For more info on the next IKF event at the Scrapyard (Orlando Kickboxing Center) contact Mrs. Caroline Mixon and The MACC Group at (407) 648-5133. Check out the fight details under IKF Bakersfield, CA, USA located on the IKF RINGSIDE NEWS Page. Well, 1999 was a testing year for the IKF Junior Division fighters (Ages 8-15) and from the looks of it, the IKF Junior Divisions will have a strong future. The Divisions are designed like amateur boxing to offer younger fighters a chance to test their skills before jumping into the adult amateur divisions. Nearly all of the bouts held in 1998 proved to be more exciting to the crowd than many of the other bouts on the events. Several promoters hosted Junior bouts during the 1998 event year and in 1999, many more are scheduled. The IKF is planning of a great schedule of IKF Junior division matches and entire Junior Division Events for 1999. Like the newly established IKF San Shou Division, the IKF has also been working to schedule Junior Division events around the globe. 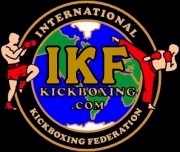 If you are a fighter between the ages of 8 and 15 years old, a trainer with fighters this age, or a promoter who wants to host Junior division matches and or events during your 1999 schedule, please e-mail the IKF by clicking HERE and let us know your desires. For more info click IKF Junior Amateur Division.